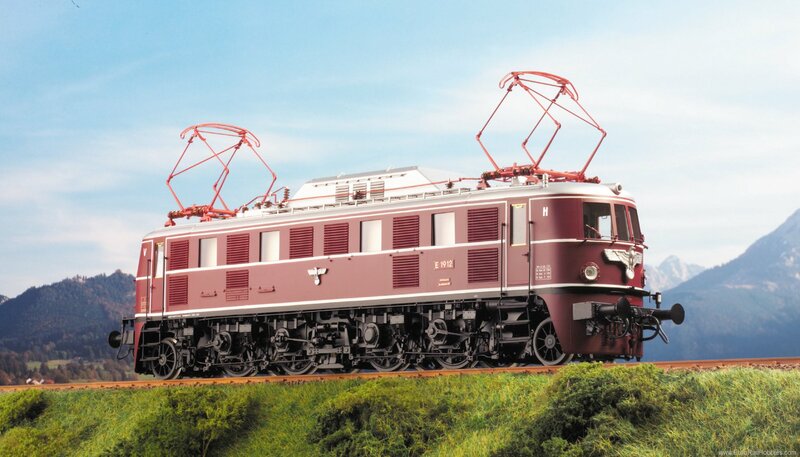 In the years 1939-40 the E19 were delivered 01 and 02 and from the SSW the E19 11And 12 of the AEG. It was the strongest framing-electric locomotives. The top speed was 180 km / h was the construction but for max. 225km / h. Since the electrical equipment had failed heavier compared to the E18, the E19 were prepared using light metal in welded design. By 1939 commencing 2nd World War it was a total of 4 copies of this series. The E19 11 and 12 differed from the AEG locomotives by other fan assembly and other roof attachments, which were significantly higher among the SSW locomotives. The brake linkage was moved outwards. The E19 12 remains as a red-painted Museumslok in Nuremberg.